For those seeking an affordable, versatile all-in-one zoom lens for their DX-format DSLR camera, the AF-S DX NIKKOR 55–200mm is a great choice. Its practical 55–200mm zoom range handles group shots, landscapes, portraits and more, while its telephoto capability brings everything closer. Plus, it delivers close-up shots at 200mm with a Maximum Reproduction Ratio (R:R) of 1/3.5x—great for macro-style shots of flowers, insects and more. 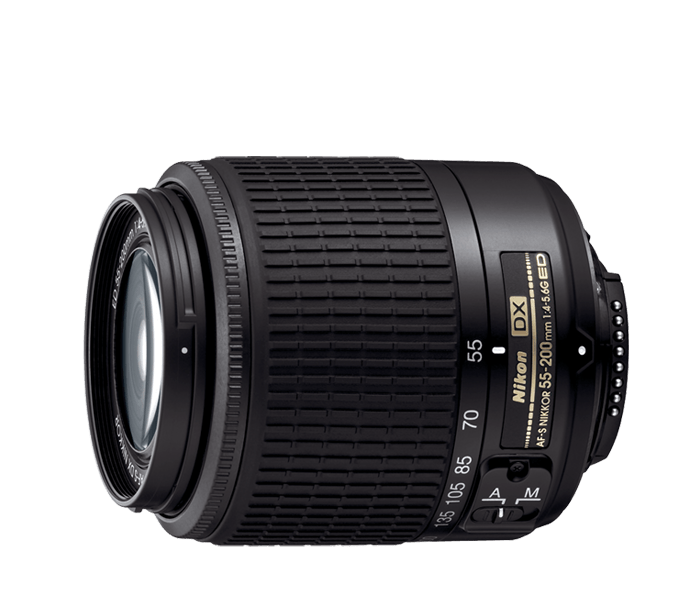 The AF-S DX Zoom-NIKKOR 55–200mm f/4-5.6G ED offers compact versatility with a powerful focal length range of 55-200mm designed exclusively for Nikon DX-format DSLRs. It’s an ideal 3.6x zoom lens for portraiture, sports or wildlife photography and an excellent companion to the AF-S DX Zoom-NIKKOR 18–55mm f/3.5-5.6G ED kit lens that may have come with your camera. The AF-S DX Zoom-NIKKOR 55–200mm features advanced Nikon lens technologies that make capturing the views of your world easier than ever—even in trying conditions. That means more opportunities for creating great photos and videos and more opportunities for creativity.